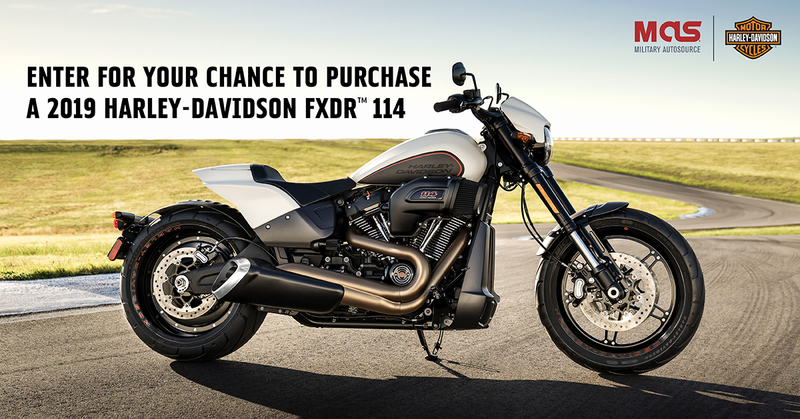 Going on now until March 31st, Military AutoSource(MAS) is running a purchase drawing for the 2019 Harley-Davidson FXDR™ 114. MAS will be selecting one winner to purchase a 2019 Harley-Davidson FXDR™ 114 each month for the next 6 months. There is a limited number of 2019 Harley-Davidson FXDR™ 114 available for this purchase drawing so don’t miss your chance to purchase the latest edition to the Softail® family that truly speaks to the performance-minded rider. This “power cruiser” combines the power of the Milwaukee-Eight® 114 engine with a lightweight chassis for ultimate performance. One look at the single seater with its 240mm rear tire and this sentiment speaks truth, “the bike appears ready to pounce the competition.” Fast on the straights. Agile in the corners. It’ll blow away your senses. Take advantage of your exclusive overseas military benefits, including preferred pricing, worldwide warranty coverage and our 100% satisfaction guarantee to own this latest edition from Harley-Davidson that truly speaks to the performance-minded rider. Softail monoshock rear suspension with a single coil-over shock with internal free-piston technology and optimized angle between the frame and swingarm for enhanced travel and response. Monoshock is equipped with an external hydraulic pre-load adjustment knob to allow the rider to quickly and easily dial in optimal suspension performance for the prevailing load and conditions. Inverted 43mm forks stiffen the front end for improved response to steering input. Single-cartridge internal fork damping technology and a triplerate spring for improved braking and handling performance. Speak to a Sales Representative for complete details. All programs and guarantees are subject to terms and conditions. All illustrations and specifications are to the best of our knowledge correct as of the date of publication. They are subject to changes made by the manufacturer and the laws or regulations of any federal, state or local government agency. Overseas Military Sales Corporation is an authorized contractor of the Exchange and NEXCOM. Military AutoSource is an authorized distributor to sell and distribute Harley-Davidson® motorcycles. This advertisement does not express or imply endorsement by the Exchange, NEXCOM, DOD components, or the Federal Government and is not sponsored by them.